When it comes to the highest latitudes of Vietnam, the province of Ha Giang (Hà Giang), is a great place for contemplating the grandiose mountainous landscapes. 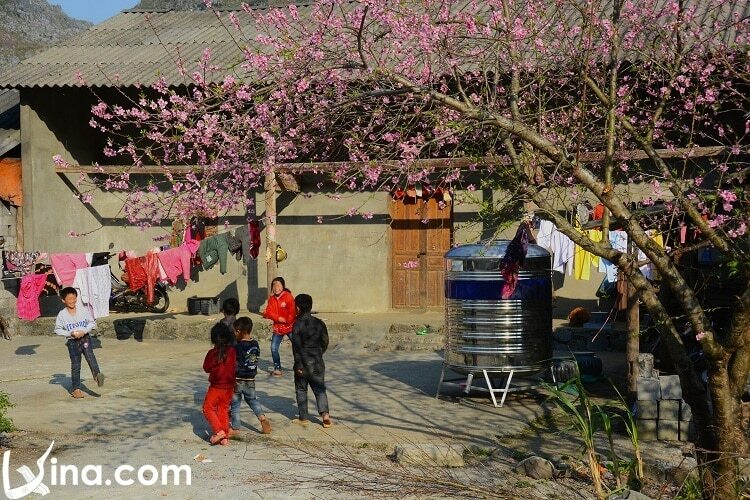 The residents in Ha Giang are mainly of minor ethnic groups. 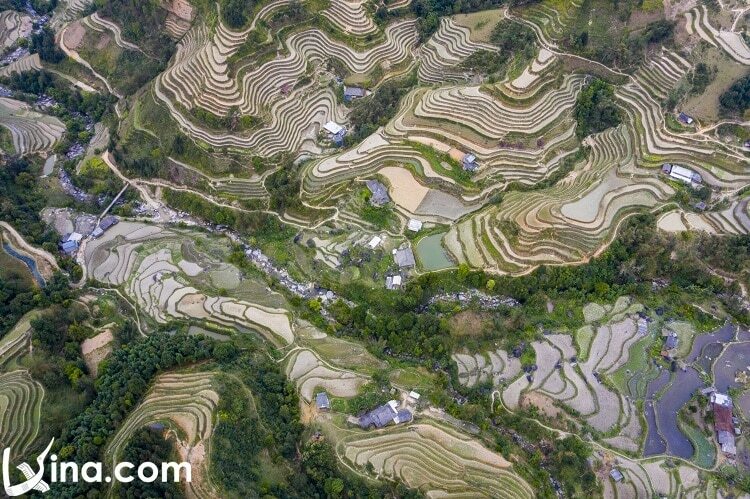 This article on Vina.com will give you a detailed guide on Ha Giang travel, helping you have an overview about this land and prepare your best if you have chance to visit it. Let’s get started! Ha Giang, a mountainous province in the North of the Southeast Asian country – Vietnam (Việt Nam), in which the Vietnam-China border gets extended over 274 km in length. This province is also a source of Lo River that flows into Vietnam and contiguous to the neighbor country China to the north with Thanh Thuy (Thanh Thuỷ) as an international border gate. Ha Giang is approximately 320km to the north of the capital Hanoi, following Highway 2. Ha Giang is rather new city with just 120 years of history. This city has gone through many difficulties in regard to unfavorable location and a lack of infrastructure. Similar to any other Vietnam’s Northern highlands, the climate in Ha Giang is cool in summer and very cold in winter. The temperature ranges from 5 to 28 Celsius degree that is rather ideal for tourism. The best time to visit Ha Giang is around or after The Lunar New Year (Tết Holiday), from February to May. This time, the scenery is very magnificent with the mountain tops hiding in the clouds, flowers of wild peach blooming everywhere. Additionally, the weather during this holiday is extremely comfortable with cool air and little rain, so that tourists do not have to bring umbrellas or raincoats with them. 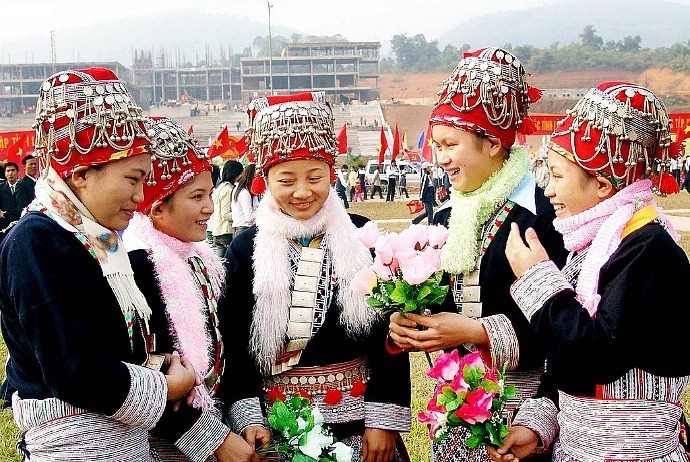 Also, there are a lot of attractive and unique festivals during this time which aim to celebrate the Lunar New Year, so that tourists could have an opportunity to understand more about Ha Giang’s ethnic culture and enjoy the atmosphere of festivals of different ethnic groups. 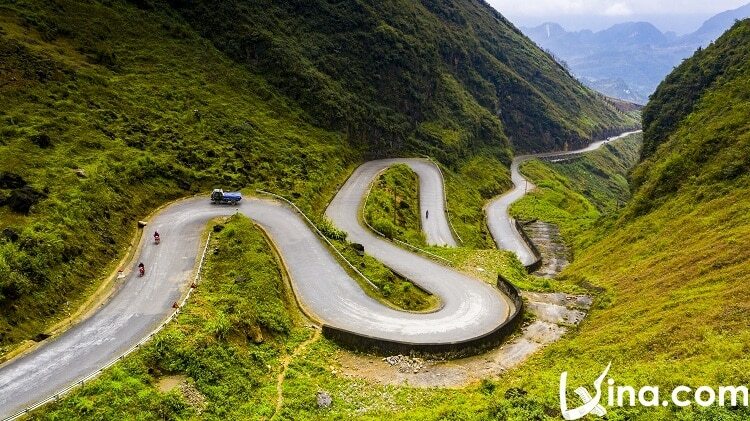 Moreover, because this is the dry season so your routes to Ha Giang will be much safer. Dong Van Rock Plateau because it makes the northern tip of Vietnam with Lung Cu Flag Tower on the Dragon Mountain. Vuong (Vương) Family is the king of Miao ethnic, of which the house is situated in Sa Phin (Sà Phìn), Dong Van (Đồng Văn), Ha Giang (Hà Giang). Aside from having gigantic size, this mansion is also impressive due to the unique design and magnificence. It was built by the Chinese stone artists and skillful builders of Hmong ethnic. 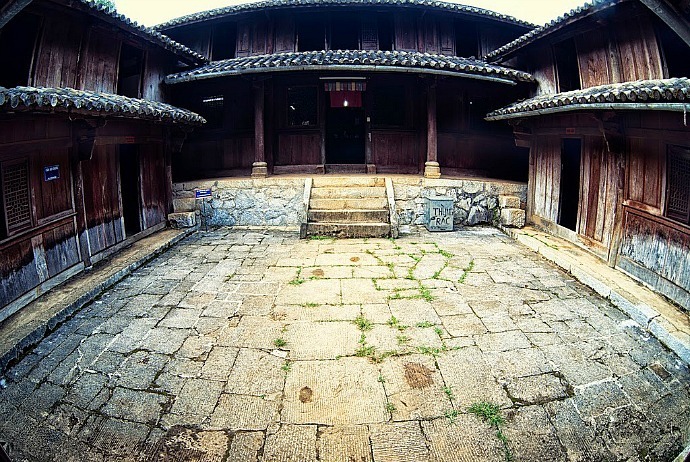 The design of t his place is affected by the traditional architecture of Quing Dynasty in China in the late 1890s and some elements from local culture of Hmong. It is a must-see place you should not skip when visiting Ha Giang. Situated on a mountain with the back shape of a tortoise, this mansion was built with the expectation of bringing prosperity and wealth to the owner as the tortoise is considered one of the four sacred animals in the belief of traditional Vietnamese. Being arranged with 4 horizontal plus with 6 vertical blocks, this house is split into 2 floors covering 64 rooms. This house was carefully decorated with the images of sacred as well as respected animals such as dragon, lion, phoenix and bat in order to show the wealth and prosperity of the family. There is a sturdy wall made from rocks that is 50 centimeters wide, with a few guarding towers plus with loopholes around this mansion. The wall protects the family against the enemies from the outside, but also creates a feeling of massiveness of the inside area of the house. The outside of the house is a rock road leading to the major entrance and the tomb. 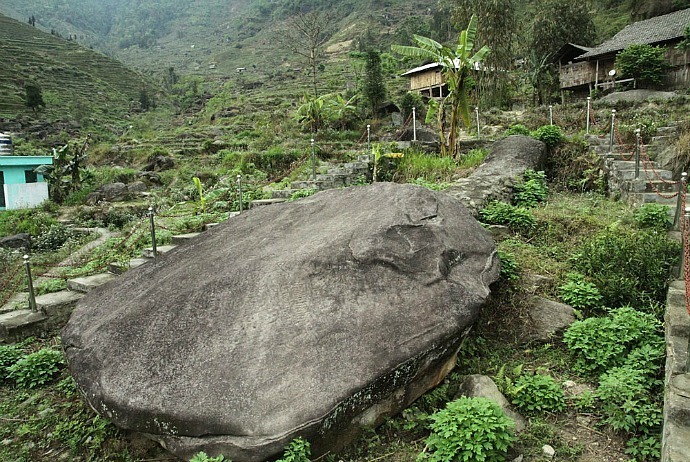 Found in 2004, this stone field is thousands of years old, located in the Valley of Nam Dan (Nấm Dấn), and has not been known widely by tourists. However, the runic symbols on rocks here are very fascinating. This stone field is situated between Tay Dan (Tây Đản) Mountain and Nam Dan (Nấm Dấn) hill, and right adjacent to Nam Khoong (Nậm Khoong) stream. The rocks here are diversified in design and types. They bear the marks of the old art traditional beauty, and weather-beaten traces from a thousand years ago. Every stone represents a certain legend of ethnic groups about beliefs and religion, and their worship to their ancestors and the God. As estimated, there are approximately 80 engravings with about 80 holes on the western side of stones. Built about 2000 years ago, Nam Dan stone field can be a group of graves made by stone of the leaders in that community or a site to worship ancestors, Gods, as well as other noticeable characters. This place possesses a significant value when it comes to culture, religion, history and science. It has a potential to become a widely known destination for tourism in the future because it has become a popular stop on the route of exploring of a large number of tourism agencies in this area in recent years. 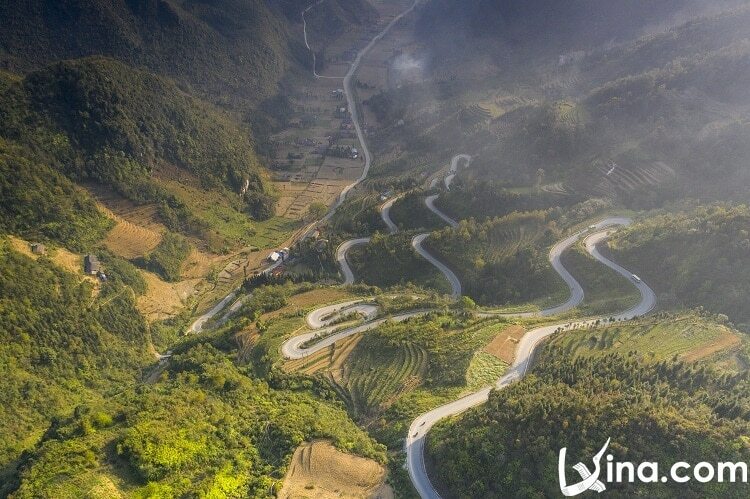 Situated in Dong Van district, about 200 km away from Ha Giang’s center area with the natural area of 3460 hectares. 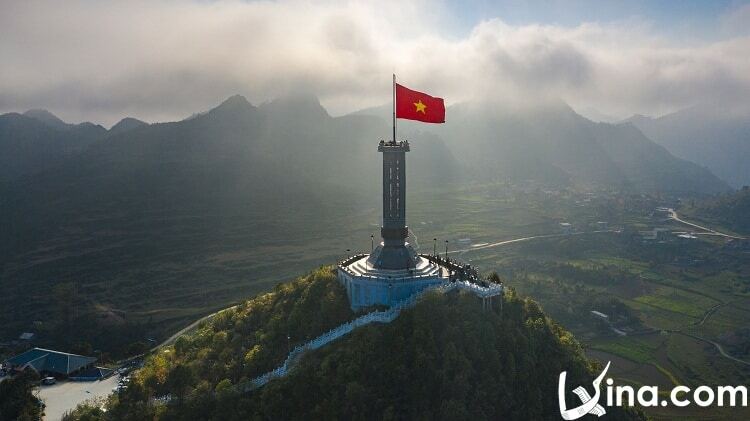 Tourists when visiting Lung Cu peak will be attracted by the magnificent mountains that hide in the clouds and the Flag Tower located on top of Long Son (Long Sơn) mountain, Lo Lo (Lô Lô) lake and terraces of locals. In addition, here, the winter is extremely cold so that visiting this destination in that time could give travelers an opportunity to contemplate real white snow that cover both the mountains and forests here, which are hardly seen in Vietnam. The population in Lung Cu contains a number of ethnic groups, with diverse features in beliefs, culture, and practices. Locals mainly grow rice on terraces as well as milpas. Even, Lo Lo (Lô Lô) and H’mong communities here still practice the traditional textile techniques. The traditional characteristics about the cultures of those ethnic groups are very interesting and diverse, so many tourists visiting here to discover the unique aspects of those communities. This is a traditional market of local people (mainly ethnic groups) which usually occurs on 26/3 of Lunar Calendar. It can be one of the most interesting and unique fairs in Vietnam and the world as well because the product is “love”. In essence, it is a place for men and women in the area to come to enjoy the atmosphere of a festival and also flirt and find their life partner. Despite the fair is situated in the Nung (Nùng)communities’ valley, it still attracts a lot of people from different areas like Dao, H’mong, Tay (Tày)… and the participants range from young to old people. Actually, living in such mountainous regions is not so exciting because of the lack of places for entertainment and the difficulty of terrain, so Khau Vai Live Fair is always attractive in the eyes of locals. Here, you could see couples and the whole families come to and find fun things to enjoy. As a result, the valley gets noisy and exciting with people cheering and talking amidst the sound of people singing and traditional flute. Participants tend to drink so much until they get drunk, as this is when they meet their loved ones or friends after one year of no seeing. The elders here remember not only the time when this fair started but also the origin of that market: about a love story of an H’mong couple. Their love was strong and admirable, but due to the conflict between two ethnic groups, they had to breakup. But, they still promised to meet one another during the night on 26/7 each year. Then, Khau Vai Love Fair started, serving as a site for everybody to go for finding their love. This is a religious activity of H’mong ethnic people in Ha Giang which happens on the Tet Holiday or when the annual farm stops. This is a typical event of H’mong community with a lot of characteristics presenting the traditional culture of H’mong people. Gau Tao Festival is celebrated to give thanks to the ancestors and the Gods for the health and wealth of the family. This is hold when people want to ask for something like children, prosperity, and love. Especially, this festival is not celebrated by the whole village but a single family so that there can be a few Gau Tao festivals per year. As usual, one day before this festival, the village’s leader will inform to the whole village population about the event. On the early morning of that event, everyone will get ready with their traditional clothes along with instruments like flute. This event contains two main parts, which are the ritual and the festival. The first part is for the main family who will prepare a meal for the ancestors. The host of that ritual will plant a high tree right on the center of the festival place with a red strip and an alcohol bag in order to call for the ancestors and the Gods and inform to the village about that festival. The second section is for some traditional activities, like fighting (just for sport) or crossbow shooting. Furthermore, this is also a place for men and women to meet one another and find love through cultural activities such as signing contest and flute dancing. The common festival may last from 3 to 5 days and happens a few times per year. The residents of this mountainous province contain mainly ethnic minorities, such as Hmong (Mông), Nung (Nùng), Dao, Tay (Tày) ethnic groups. Due to the ethnical diverisity, tourists could not see anywhere else having more fusing traditions than the province of Ha Giang. Each of the ethnic group has its own custom when it comes to worship, wedding, festivals, and funeral. For illustrating, a groom of Hmong ethnic could just get married only if he is possible to rob his wife but nobody knows about that action. 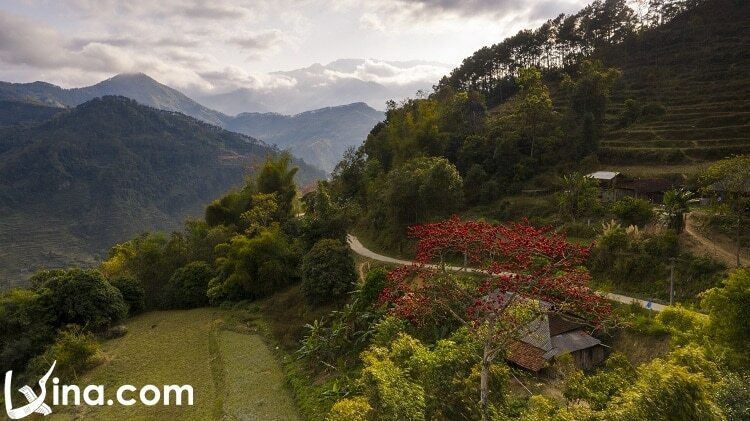 In Ha Giang, it is recommended to travel by a motorbike or take a trekking tour because many ethnic hamlets here are living separately from the major society. When coming to those tribes, you could see a lot of charms on their doors which aim to expel the demons as well as evil spirits. Local people here are very friendly that welcome tourists like honored guests. They might treat you their speciality: Thang Co (hot-pot of horse meat). You can find a unique spot in Ha Giang that is very interesting in the eyes of tourists, particularly international ones – “Khau Vai Love Market”. This market is organized monthly on the 26th and 27th of the Lunar Year. There, singles and married people in various ethnic groups gather to find their ideal life partner and share their understanding and feeling to one another. 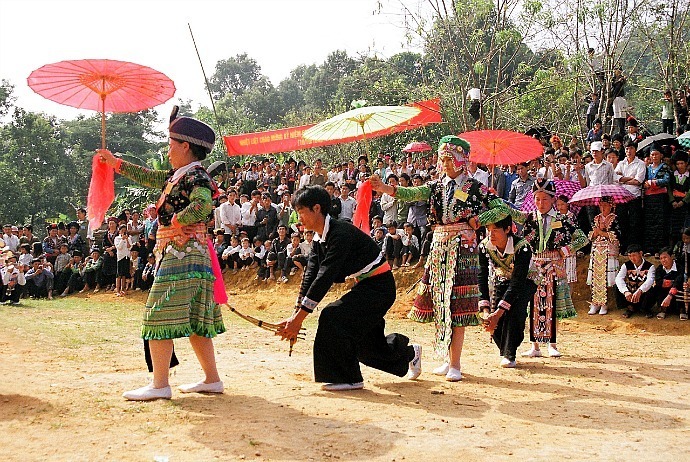 The best time to visit Ha Giang might be Lunar New Year, when tourists could see a variety of traditional customs of different ethnic minorities, like rain ritual, celebrating success, sons ritual, pan-pie performance, crossbow shooting competition, and the competition of “Con Throwing (Ném Còn). 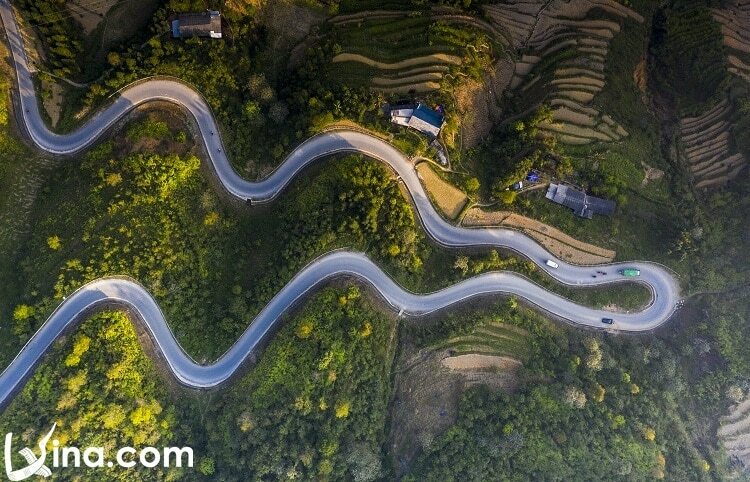 As the infrastructure in Ha Giang is still low, and on the way of improvement, people could just reach this place by motorbikes or car along the Highway 2 to the northern area of Hanoi, via 3 provinces, which are Vinh Phuc (Vĩnh Phúc), Phu Tho (Phú Thọ), and Tuyen Quang (Tuyên Quang). If you have a private car, it is great; yet, if not, you could take a coach in some coach stations in Hanoi (Hà Nội), such as Giap Bat (Giáp Bát), My Dinh (Mỹ Đình), Gia Lam (Gia Lâm), and Ha Dong (Hà Đông). The price is rather low, ranging from 100,000 VND (approximately $5) each one-way ticket.